There are many reasons to love the sandwich: they're fast and easy to assemble, endlessly variable and incredibly convenient, which is, after all, why they were invented in the first place. Read more about their history here. Peel the eggs, mash them with a fork, then stir in all the other ingredients. Season with pepper only; the capers should make the mixture salty enough. Divide the filling between two slices of bread then top with the remaining slices. 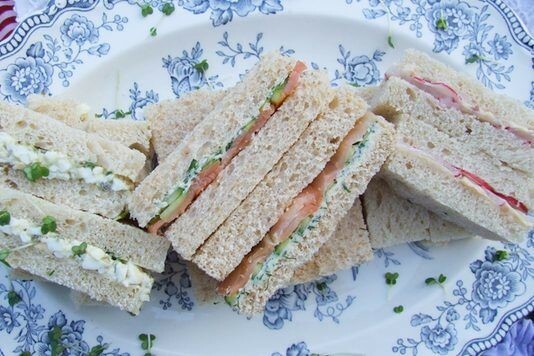 Remove the crusts and cut into finger sandwiches. Finely chop the anchovies and use a fork to mash them into the butter. Mix until well combined. Spread two pieces of bread with the butter then add a layer of radishes on each. Top with the remaining bread, remove the crusts and slice into fingers. Season the butter with black pepper and spread a layer over two slices of the bread. Top with a layer of cucumber followed by a layer of smoked salmon. Remove the crusts and slice into fingers.